Twelve-hour shifts are still one of the most frequently debated topics in shift work management. Managers, shiftworkers, union representatives, federal regulators, corporate policy-makers, and academic experts continue to question and debate how 12-hour shifts compare to 8-hour shifts. alertness, health and family life? 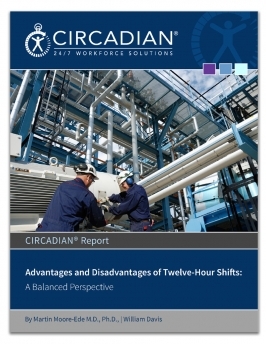 CIRCADIAN consultants have gathered a great deal of first-hand information from surveying organizations who use 12-hour shifts. To learn about the practices, policies, results and impacts, download this white paper. © 2018 Circadian Technologies, Inc. All Rights Reserved.